The Conference was attended by the representatives of Central Banks and Monetary Authorities of 17 OIC member countries including Bahrain, Brunei, Egypt, Jordan, Libya, Malaysia, Mauritania, Morocco, Oman, Pakistan, Palestine, Qatar, Saudi Arabia, Sudan, Tunisia, Turkey, and UAE. Representatives of European Central Bank, Islamic Development Bank, and National Statistical Office of Sudan also attended the Conference. The Centre was represented by Dr. Nihat Gumus, Project Consultant at Statistics and Information Department. 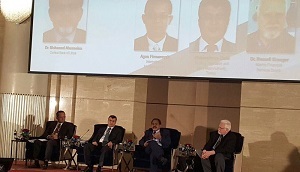 The main objective of the Conference was to enable the discussion of the recent situation in the development, collection, dissemination and usage of Financial Soundness Indicators (FSIs) published by IMF and Prudential and Structural Indicators for Islamic Finance Institutions (PSIFIs) published by IFSB. The conference was also targeted to figure out the required steps to determine and fill the existing gaps in FSIs and PSIFIs.